IoT devices and social media are becoming increasingly pervasive in our daily life. Our position is that raw data from sensors on the device has to remain on the device, and filtered, aggregated, analyzed, obscured and/or encrypted subject to the user’s privacy requirement before it can be shared. Thus, the goal is to address privacy preservation during data collection at the device level. This project focuses on resource-constrained IoT devices, as well as the analysis of unstructured, multimodal data. In addition, we aim to explore privacy leakage detection and machine learning on multiple devices and sources. This project focuses on analyzing risk and privacy preservation in the context of machine learning as well as data publishing. This includes the analysis of the trade-off between privacy, predictive power, and interpretability of machine learning model. In addition, this project also researches into techniques to enable the generation of privacy-aware unstructured dataset of acceptable data utility. In many contexts, the collections, storage and processing of sensitive data is done by different parties. This project research on privacy-aware collaborative without causing privacy breach. 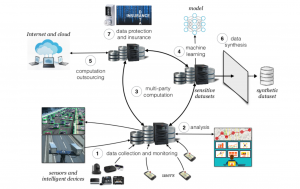 The research will consider scenarios where interaction with external parties is involved in the collaborative computation, where sanitized data, models or insights are shared to perform collaborative computation. In practice, despite all technological and legal efforts, there will never a guarantee for perfect privacy. Most services nowadays rely on sensitive data such as demographics, location, facial images and so on. Also, security and privacy are often in direct conflict. Statistics of privacy breaches have also shown that many attacks from “inside the house”, i.e., from individuals with unique access to the data. This project, therefore, pursues two technological efforts orthogonal to efforts towards privacy-preserving technologies: Quantifying Privacy Risks and Privacy Insurance & Pricing.